If I seem a little quiet as of late, it is because that two weeks after Christmas, I have to be ready to throw my oldest daughter a birthday party. Two weeks sounds like plenty of time, but for some reason the week between Christmas and New Year's just evaporates, and I'm left staring at a birthday coming straight at me. And, so, I like to figure out the details like "where, when, who and what" at the same time that I am shopping online, running to stores, addressing Christmas cards, planning holiday meals and. . .well, you know. Another thing to know: I almost always host the parties in home. For one, I'm a control freak. Second, I'm cheap. So even though an American Girl Doll store opened not a half-hour's drive from my home, the thought of spending $450 to usher my daughter and her friends into her 8th year just blows my mind. So, we're now leaning toward another DIY event. And, I'm toying with the idea of hosting a good old-fashioned tea party for her and her friends. I'm a bit torn on this because, while I think I could make it fun, it does sounds a bit "quaint" in these days of diva parties. But, I'm pressing forward and looking at as many websites as I can. An 8 year old's Tea Party at the Four Seasons Hotel. 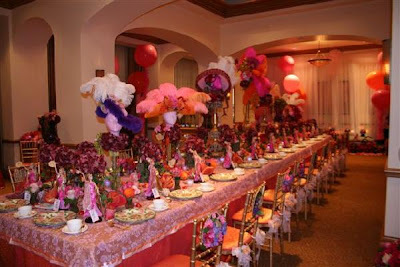 Our client wanted to celebrate her daughter's 8th birthday in an uncommonly spectacular way. The theme was a formal English Tea Party. When guests arrived, they were given all the materials needed to create their very own Tea Party hat. When the doors to the party were opened, a Harpist played "Happy Birthday". The table linen was an orange sherbert silk, with an overlay cloth of pink, hand painted silk with orange double faced satin ribbon border. The gold Chiavari chairs were upholstered in Orange Sherbert silk. The back of each chair featured a straw hat adorned with Roses, Hydrangea, and Cymmbidium Orchids. At each place setting, a custom gowned Barbi held her own straw hat covered with seasonal mixed mini flowers (to salute our guest of honor), standing in front of a Topiary of Hydrangea. Napkins were made of Orange Sherbert silk, and placed in a spring colored Manolo Blahnik shoe. The seven main floral arrangements on the guest table, were created off of wig forms which had been covered in hand tinted silk leaves. The hats were made of Ostrich and Maribou feathers, Roses, Hydrangea, Cymbidium Orchids, Peonies, and leaves. To compliment our hat themed floral arrangements, we added 8 hand bags made of woven branches, which had either Pave' Roses or Tulips. On the perimeter of the room, 8 dress forms were custom made as floral arrangements, in eight seperate floral vignettes which featured more Manolo Blahnik pumps, mini dress forms, and over 3,000 Pink Revel Roses. After Tea and Scones were served, a fashion show was held for each guest to model their hat creation. Each little girl was given a gift, and a "Diva in Training Survival Kit". We took children's jewelry, make up and hand bags, and customized the packaging into "Harry Winston", "Chanel" and "Judith Lieber". It was the grandest affair any 8 year old (or adult) has ever seen. 2) Did the girls go home with just one Manolo Blahnik pump? Please feel free to weigh in on any of the above. I'm too stunned to form an intelligent thought. I can't believe they only got one M-B shoe. That's an outrage! Um, WOW! I got nothing. And we wonder why we are drowning in debt. What will that child want when she is 16? Wow, I was impressed with myself when the girls at M's 5th birthday party made themselves pink crowns - ribbon, a rubber band, and assorted stickers from the dollar store. That picture makes my brain hurt. Similar concept could translate to a tea party. Good luck! If an eight-year-old knows the brand names the author threw around, I will throw up. This is obviously a "my husband makes more money than your husband" party. To Sabrina T, these are the girls that will be on MTV's "My Sweet Sixteen" in another eight years. Good gracious. A tea party is quaint and lovely. The girls will have a ball and their moms will hug you. Rather than trying to thrust a few more divas on the world, let's try to mold a few more ladies, shall we? Ummm, yeah.... I think my 8 year olds' party is going to be rollerskating.... again. I um...I have no words. That is just insane. I've been to some insane kid parties, but that one would top the cake. For my daughters birthday (the 7th) we took a few of her friends Cosmic bowling, mostly because I didn't want 6 insane 6 & 7 year old girls tearing apart my house. Might have been cheaper to hold a Wii bowling party though. Oh and also too SabrinaT: Have you seen my Sweet 16? I think it's on MTV. I caught it once and it was crazy. People who do this kind of thing for a kids birthday, have to up it every year. Then their spoiled brats end up on reality TV whining about how horrible their parents really are, as they spend $50k on their 16th bday. Imagine the disappointment I evoked when I hosted the 4/6 yo party on Sunday and had the kids from the neighborhood paint wooden ornaments instead of sending home goodie bags and almost every kid asked if they were getting a goodie bag on the way out. My internal response was, "take your flippin ornament and this candy cane and get out of my house." I agree mrs. q - ladies not divas! My son has a birthday 2 weeks BEFORE Christmas -- so I know the pressure. You've got to pace yourself! As for that party: WTF? What is this girl going to expect for her wedding? She's a bridezilla in training. I think my head just exploded from all that pink! Whoa! My first reaction would be: Holy crap people. It's a birthday party NOT a royal coronation. And my second would be WOW - they could feed a third world country with what they spent on that shindig.. Sorry for the swearing but seriously, what the hell is that? Actually, I do play the harp. Wanna hire me? I have to wonder what the hell those parents are going to do for birthday #9. We do the at-home thing also - it still adds up, what with the matching birthday plates, napkins, etc, and prizes for games and all (and yes, we make our own cake). Holy balls. That is more extravagant than my wedding, for crying out loud!! Tea party sounds sweet. It will basically be a birthday party but with the word "tea" in it, right? Will she drink tea? Or is it juice and lemonade? As for the parties at home; I love those! Home cooking cakes & the coziness, there's nothing like it. My children are both born in January, so I feel your pain! What an ostentatious little brat, and her gaudy, over-indulgent parents. I feel your pressure! My Boy has a birthday two and a half weeks after Christmas. I believe this year's theme might be "Snowman." The guests will go home with tasteful gift bags from the dollar store.